We had a fantastic response to our January questionnaire, which aimed to determine your priorities when it comes to medical research funded by SRUK. As a small charity, it is important that we target our funds so they have the most impact and inform you, our supporters, how we are helping meet your needs. With input from our trustees and clinicians, we identified 13 research topics and asked you to rank them from 1 to 13, with 1 being the highest priority. The survey closed in the middle of February and we had received 253 complete and 27 incomplete responses. Of the total 280 responses, the majority of respondents identified themselves as a patient, relative, carer or supporter, with 2.4% describing themselves as healthcare professionals and 1.6% as researchers. Nearly 70% of the respondents were aged 60 or older, with 90.3% of the paper forms being returned by people in this age bracket. Thirteen per cent of respondents gave their gender as male, 87% as female and one person skipped this question. The breakdown of respondents' ages can be seen in the table. There were a number of research topics that were clearly identified as being more important than others by respondents, with 26% of people choosing causes of Scleroderma and Raynaud's as their top priority, 20% choosing new and safer treatments, 18% choosing improved and earlier detection and diagnosis, and 11% choosing detection of progression, complications and response to treatment. New and safer treatments was in people's top 3 priorities in over 50% of responses. Health economics, epidemiology and financial impact were considered low priorities for the majority of respondents. There are a limited number of treatments available for the management of Scleroderma and Raynaud's phenomenon, and there is no cure. The treatments that are available have side-effects that can have a negative impact on quality of life. The responses we received reflect this and the need to identify treatments with fewer side-effects. Detection of progression, complications and response to treatment is important as this leads to earlier, more effective treatment (hopefully giving a better long term prognosis for patients). Improving our understanding of the causes of Scleroderma and Raynaud's will lead the direction of future research by revealing possible triggers and drug targets. 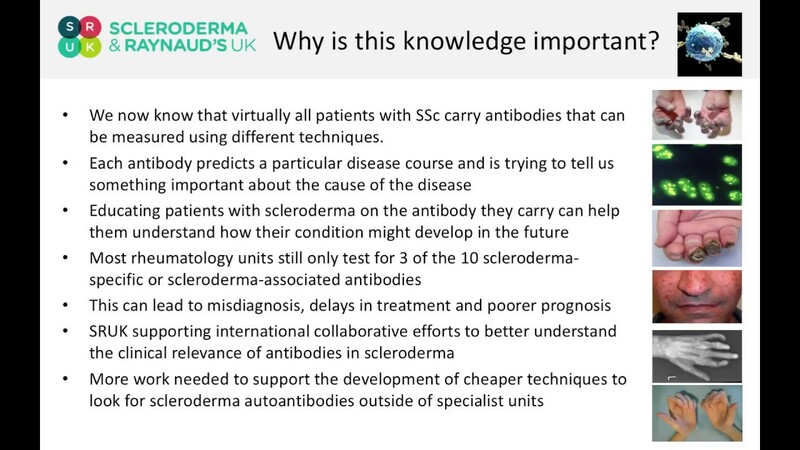 For example, previous research has helped us identify biological markers that indicate a predisposition to the subtypes of scleroderma, and identify genetic markers to assist in the diagnosis of these conditions. Education of healthcare professionals has been highlighted by this survey as an area that needs improvement to ensure patients are correctly diagnosed and receive the right treatment and care at an earlier point in time. The top 5 priorities identified from your feedback will be used to inform our research strategy. The research strategy will give us direction as to how to invest our money to have the greatest impact on your lives. The research strategy will be published on our website shortly.